They started with an award-winning series of anti-corruption murals on prominent blast walls near government ministries[ii]. The paintings of eyes, accompanied by the slogan, ‘I See You’, were designed as a warning to corrupt officials. In another series, ‘Heroes of my city’, they sought to celebrate everyday heroes such as municipal workers, teachers and nurses. The aim was to create an alternative narrative to warrior and fighter heroes who are traditionally celebrated in Afghan cultures [iii]. In another series they sought to counter the culture of violence and war by painting pictures centred on hearts, representing the love that Afghans have for their country. 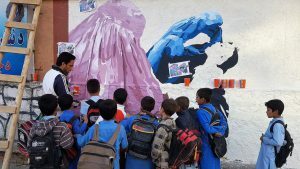 Through their strategically placed pieces of street art they look to engage and educate Kabul’s citizens on issues such as women’s rights. 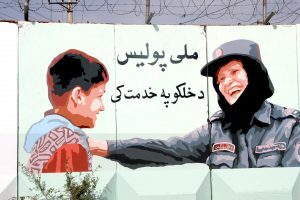 One mural they put up on a blast wall near the area in Kabul where an Afghan women was fatally lynched by a group of men after being falsely accused of burning the Koran. The slogan beneath the pictures says, ‘A brave man supports women’. Graffiti is rare in Kabul so the street art has generated significant attention. 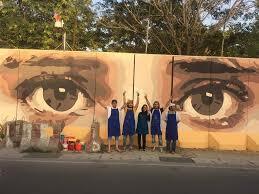 ArtLords conduct the mural painting process specifically to ensure the painting become opportunities for open-air public art workshops as passers-by are invited to join in and contribute to the paintings. The art is purposefully drawn using a simple paint-by numbers design to enable anyone to be able to participate in the painting. Led by its co-founders Omaid Sharifi and Kabir Mokamel, ArtLords does not accept government money[iv]. They want to retain ownership of their work while acting ‘as a platform that allows for the use of the arts for specific tasks that measurably contribute to consent building on any given subject and that contributes to the positive transformation of society’. They aim to promote critical thinking, transform the face of Kabul, introduce creative methods to affect behavioural change, to create a youth movement to hold the authorities accountable and address the culture of corruption and to use art to solve conflict, build trust and foster understanding based on knowing the other[v].